Russia’s first stealth fighter jet will reportedly enter mass production in 2019. Russia has designated its first indigenously designed and build fifth-generation stealth fighter the Su-57, the head of the Russian Air Force, Colonel-General Viktor Bondarev, told local media on August 11. “The decision has been made and the plane has got its name like a child after the birth. 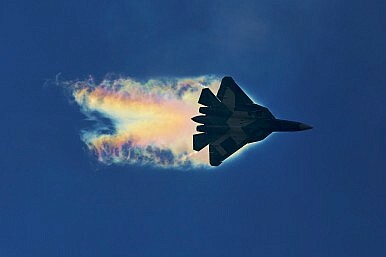 Su-57 is how we now call it,” TASS news agency quoted Bondarev. The Sukhoi Su-57 is a fifth-generation multirole, single seat, twin-engine air superiority/deep air support fighter intended to replace the Russian Air Force’s fleet of MiG-29 and Su-27. The Su-57 will be armed with beyond visual range air-to-air missiles as well as of air-to-ground missiles including the extended range Kh-35UE tactical cruise missile. The Su-57 can also carry the the nuclear-capable BrahMos-A supersonic cruise missile. “Nicknamed ‘Harpoonski’ [Kharpunskiy] due to its similarity to the U.S.-made Harpoon anti-ship missile, the Kh-35UE is a subsonic, sea-skimming anti-ship cruise missile armed with a 145 High Explosive (HE) fragmentation, penetration warhead,” I explained. Both the BrahMos-A and KH-35UE do not fit into the aircraft’s internal weapon bay and consequently will need to be carried under the aircraft’s wings in a transport launch canister, which will reduce the fighter jet’s stealthiness. The aircraft performed its maiden flight already in 2010. The aircraft will complete its first set of flight tests by the end of 2017, Bondarev said last month. “The announcement appears to indicate a delay in the [Su-57] program as mass production of the stealth fighter jet was slated to begin this year,” I wrote in July. “Now, the aircraft’s trials are expected to be completed in 2018.” Other information indicates that experimental design work on the fighter aircraft will not be completed until 2019. The Russian Air Force is currently testing nine Su-57 prototypes with two additional aircraft expected to be delivered to the service by the end of the year. Hundreds of test flights with prototypes have occurred over the last two years. However, one of the main technical obstacles to overcome remains designing and producing a next-generation engine for the aircraft. As of now, Su-57 prototypes are equipped with a derivative of the Saturn AL-41F1S engine, dubbed AL-41F1, an engine also installed on the Sukhoi Su-35S Flanker-E. While the Su-57 was slated to conduct its maiden flight this year, a new engine— the next-generation Saturn izdeliye 30 — will reportedly not be ready until 2020. The Saturn izdeliye 30 will feature increased thrust and fuel efficiency and is also expected to improve the fighter jet’s stealth characteristics given the use of new composite materials.